The first roads in this section of the State were made by the Canadian Indians, long before the territory was visited by white men. The first passed from Memphremagog lake, up Clyde river, through Charleston to Brighton, in Essex county, ending at Island pond. The second route for Indian travel was from Sherbrooke, up the Canada river to Norton pond, thence northwest to the Ferren river, thence down that river to Clyde river, following up the Clyde to the outlet of Island pond, whence it probably passed through Brighton and down Pall stream to its junction with the stream from Maidstone lake, thence to Maidstone lake, and from there to Moose river, in Victory, following this river to the Connecticut, below St. Johnsbury. As early as 1776, in the midst of the revolutionary struggle, the military road was commenced by Gen. Bailey, which was to extend through from Peacham to Lake Champlain. In 1779, it was extended, by Col. Hazen, whence it took the name of the Hazen road, through Cabot, Walden, Hardwick, Greensboro, Craftsbury, and Albany, to Lowell. He had cut the road to the notch in the mountains which still bears his name, when the news of peace came, and he left the unused road for the benefit of the settlers that were soon to come in. The following description of thoroughfares, together with those mentioned, will give the reader a fair idea of the state of the county in this respect in 1815. A road from Newbury to Derby, built in 1794, passed through Ryegate, Barnet, St. Johnsbury, Lyndon, Wheelock Hollow and Sheffield, where it received the travel from Danville Green, and thence via Sheffield, it passed Barton Mills, where it received the Montpelier travel, and thence extended to Brownington, where it received the Albany travel, and proceeded west of Brownington pond through Derby into Canada. A second road from Newbury to Stanstead, Canada East, passed up the Connecticut river to Guildhall, thence through Brunswick, Wenlock, and Brighton, into Morgan, and through Holland into Canada. In the autumn of 1807, a road from Irasburgh to Troy was cut through by parties from Danville and Peacham, to open more conveniently this great northern route through the county. Over this route were transported hundreds of tons of salts and pearl ashes to Montreal and Quebec. In 1808, large quantities of this commodity being left in the county after the embargo times, Barton river was cleaned out, and the casks were put upon rafts and barges and transported by water to Quebec. This circumstance gave the name of “the landing” to that part of Barton near the Irasburgh line where the merchandise was put on board the boats. It must be remembered that at this time the principal support of the inhabitants of the northern part of the State consisted in the manufacture of and traffic in these ashes. As the country was cleared up and one farm after another was reclaimed from the wilderness and manufactures of different kinds increased, it became necessary to have better facilities for transportation than could be afforded by the old turnpikes. The want of a railroad was sadly felt. And when the desired result was obtained it gave a great impetus to the growth of the country, opening up new enterprises and stimulating agriculture to a vigor to which it owes its present proportions. On November 10, 1835, the Connecticut & Passumpsic Rivers Railroad was chartered by the legislature; but owing to the difficulty experienced in securing subscriptions to stock, nothing was done toward building the road, so the charter became void. It was revived, however, October 31, 1843, and the time for the beginning of its construction limited to three years. As originally chartered, the road was to run from some point near the Connecticut river on the Massachusetts line, up the Connecticut and Passumpsic valleys, reaching Canada at some point in Newport or Derby, as might be feasible. By an act of 1845, the right to "divide the route at the White river, near its mouth," was granted, recognizing the northern half as the Connecticut & Passumpsic Rivers Railroad, and allowing that portion to retain all subscriptions to the stock already received. The company was organized in January, 1846, with Erastus Fairbanks, president. The survey was begun in April, and grading commenced soon after. October 10, 1848, the road was formally opened to Bradford, a distance of 28.37 miles from White River Junction, and November 6th of the same year was opened through to Wells river, 40.17 miles. St. Johnsbury was reached in 1852, and Barton became the terminus in 1858-'59. Thus the work proceeded gradually, as stock was taken and funds procured. Newport became a railroad town in 1863, during which year the grading was completed to the Canada line. This point gained, another halt occurred until the connecting link from the Grand Trunk line, at Lenoxville, Can., 33.75 miles, should be assured. On the first of July, 1870, this link, under the title of the Massawippi Valley Railroad, was ready for trains, and has been operated since by the C. & P. R. R. R., under a contract for 999 years. Practically, however, the terminus of this road is at Sherbrooke, three miles farther north, where its round-house is located, using the Grand Trunk road this distance. The total mileage of the road is thus 145 miles, with connections as follows: at White River Junction with the Central Vermont and Northern railroads; at Wells river with the Boston, Concord & Montreal, and Wells River & Montreal lines; at St. Johnsbury with the St. Johnsbury & Lake Champlain division of the Portland & Ogdensburg road; at Newport with the South Eastern Railway; and at Sherbrooke, P. Q., with the Grand Trunk road. The portion of the road south of White River Junction, as originally chartered was given over to another corporation, when the division was made, to be known as the Connecticut River railroad, and is now leased and operated by the Central Vermont Railroad Co. The handsome steamer, “Lady of the Lake,” plying on Lake Memphremagog, is leased by the C. & P. R. R. R., and is run as an excursion boat, making regular trips during the summer. The company also owns the Missisquoi & Clyde Rivers railroad, extending from Newport to Richford, it having come into their possession by mortgage. It is operated under lease by the South Eastern Railway. Soon after the completion of the road to Newport, its second president, Henry Keyes, of Newbury, Vt., died, and the present presiding officer, Emmons Raymond, of Cambridge, Mass., was elected, he having now held the position nearly twenty years. Hon. Elijah Cleveland, of Coventry, aged nearly eighty-eight years, has been secretary of the corporation twenty-eight years. Mr. Cleveland has also been of inestimable service in securing to Orleans county the advantages this road gives. The principal Vermont office of the railroad is at Lyndonville, where its shops are located. A business office is located at Boston. The present officers of the corporation are as follows: Emmons Raymond, of Cambridge, Mass., president; W. R. Blodgett, of Boston, Mass., vice-president; N. P. Lovering, of Boston, Mass., treasurer; Elijah Cleveland, of Coventry, secretary; and Amos Barnes, Alden Spear, C. W. Pierce, and F. A. Peters, all of Boston, Stephen Foster, of Derby Line, T. P. Redfield, of Montpelier, and S. S. Thompson, of Lyndonville, directors. The Missisquoi & Clyde Rivers R. R., extending from Newport to Richford, was chartered November 11, 1869, with the privilege of extending the line to Island Pond, in Essex county. The road was completed in 1873, since which time it has been operated under lease, by the South Eastern Railway Co., of Canada, forming the southern division of that line. The present officers of the M. & G. R. R. R., are Hon. W. G. Elkins, president ; Col. O. N. Elkins, secretary and treasurer; and Hon. W. G. Elkins, Col. O. N. Elkins, H. C. Wilson, J. W. Currier, and J. H. Hamilton, directors. The prime mover and principal adviser in the construction of the road was Hon. Asa B. Foster, of Waterloo, Conn., who remained actively interested in the corporation until his death, in October, 1877. In addition to these railroads there is in process of erection, the Burlington & Northeastern R. R., mentioned on page 38. The Northern Oziris was established at Derby by J. M. Stevens, in 1831, the first number appearing December 15th. After an interval of a month the second number appeared, in which it was said: “The Oziris will be published on every Thursday morning during the year, and we have no good reason to doubt it will continue so to be published for the next half century.” Notwithstanding the sanguine expectations thus expressed by the publisher, however, the final number appeared April 19, 1832. The Yeomans Record was established at Irasburgh in 1845, by E. Rawson, the first number appearing August 13th. The sheet was neutral in politics, its columns being open alike to all parties, and Whigs, Democrats and Libertymen used it for the expression of their various opinions. On September 29, 1847, Mr. Rawson sold out to A. G. Conant, who conducted the enterprise a few months, then, March 29, 1848, re-sold to Mr. Rawson, who continued the publication until March 20, 1850, when it died for want of sufficient support. 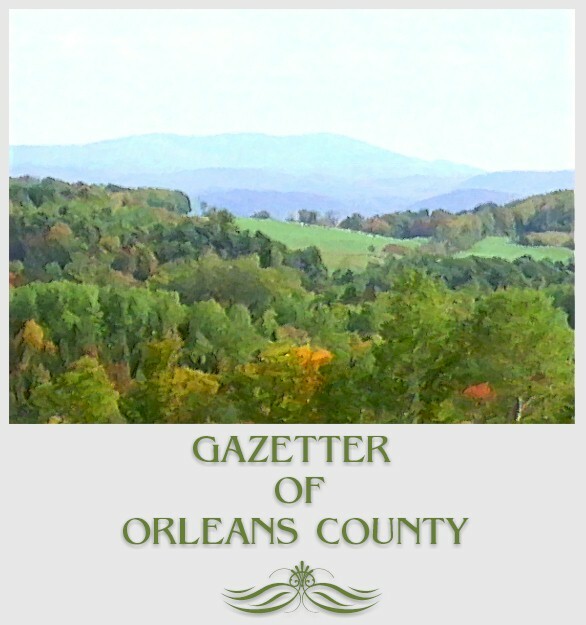 The Orleans County Gazette was established a few weeks later, at Irasburgh, May 11, 1850. It was published by Leonard B. Jameson, and edited by him and John E. Jameson. At the commencement of the third volume, May 8, 1852, J. M. Dana became the sole editor and publisher. At the commencement of the fifth volume, June 17, 1854, George W. Hartshorn became editor and publisher, remaining in that capacity until it was united with the North Union, of West Charleston, in 1855. The North Union was established at West Charleston, June 10, 1854, by E. E. G. Wheeler and F. C. Harrington, publishers and editors. September 23, 1854, Mr. Wheeler retired from the paper, and it was edited and published by F. C. Harrington. In July, 1856, it passed into the hands of stockholders, with G. A. Hinman, editor. In 1855, the Gazette was united with it, and the paper was continued until a short time previous to the late rebellion. The Orleans Independent Standard was commenced at Irasburgh, January 4, 1856, by A. A. Earle, who continued its publication there until January 1, 1896, when he removed the paper to Barton and continued it there until November 14, 1871, when it was sold to the Newport Express to form the Express and Standard. The Newport News was established at Newport, May 20, 1863, by Charles C. Spaulding, publisher and editor. It professed to be a Union paper, but instead of living up to its professions, it was very neutral at first, but, in August, 1864, boldly showed what it had ever been at heart—a Democratic organ. This proved unfavorable to its success and obnoxious to the greater portion of its supporters, and it was discontinued December 8, 1864, the materials being sold to the Vermont Union, at Lyndon. The Green Mountain Express was commenced at Irasburgh by H. & G. H. Bradford, May 21, 1863, and continued by them about one year, when the enterprise was abandoned and the materials sold to W. G. Cambridge, in September, 1864. The Newport Republican was started at Newport, October 19, 1864, by W. G. Cambridge, with the materials purchased of the defunct Green Mountain Express. Mr. Cambridge was a stranger in the county and secured but a limited support. Consequently, on the first of March, following, the paper passes into the hands of D. K. Simonds, Esq., and Royal Cummings, the name being changed to the Newport Express, Mr. Simonds assuming the editorial charge. After these frequent changes, with many embarrassments, the Express became firmly founded. In April, 1866, Mr. Simonds, desiring to give his undivided attention to the practice of the law, sold his interest in the paper to D. M. Camp, who, with the issue of April, 17, 1866, became editor and associate publisher. July 12, 1869, Mr. Camp purchased Mr. Cummings' entire interest in the business. November 14, 1871, he purchased the Orleans Independent Standard of A. A. Earle, of Barton, and merged it with the Express under the name of the Express and Standard. In January, 1872, finding the work too severe and business increasing, Mr. Camp associated with him E. A. Stewart, of Derby, who soon moved to Newport, and, until April 1, 1881, performed much of the editorial work. In April, 1881, Mr. Stewart sold his interest in the paper to Mr. Camp, who associated with him P. O. Holt and Homer Thrasher, combining the newspaper, job business, and wholesale trade in stationery and small ware. Mr. Camp continued the editorial management, assisted by C. F. Raney. In March, 1883, Mr. Camp purchased the entire concern, and is now sole owner and publisher, though Mr. Raney still assists in the editorial work, making one of the largest and best local papers in the State. The Archives of Science and Transactions of the Orleans County Society of Natural Sciences, was commenced October 1, 1870, under the editorial charge of J. M. Currier, M. D., of Newport, George A. Hinman, M. D., of West Charleston, and the publication committee of the Orleans County Society of Natural Sciences, consisting of Hon. J. L. Edwards and Rev. J. G. Lorimer, of Derby, and J. M. Currier, M. D. It was published quarterly at Newport, by the senior editor, in pamphlet form, containing sixty-four octavo pages, printed by Royal Cummings. The design of the work was to afford the scientific men of Vermont an opportunity to record scientific facts, results of scientific observations and original investigations in all branches of science. It was discontinued several years since. The Vermont Farmer was commenced at Newport, Royal Cummings, publisher, and T. H. Hopkins, editor, Saturday, December 9, 1870. A short time subsequent it was removed to St. Johnsbury and died soon after. The Barton Landing Advance was commenced at Barton Landing, by C. R. Jamason, now of Swanton, Vermont, in the beginning of June, 1871. Eight numbers were issued, when, the enterprise proving unprofitable, the paper was discontinued. The Orleans County Monitor was established at Barton, January 8, 1872, by Ellery H. Webster, a first-class printer and a good editorial writer. The citizens of the town having paid Mr. Earle of the Independent Standard $500 for removing that paper to Barton, were disappointed that he should sell the Standard to be removed to Newport, and thus gave Mr. Webster a generous support in his enterprise. The Monitor started with about 1,000 subscribers and has had a steady growth in numbers of subscribers and influence since. Mr. G. H. Blake, the present proprietor, has been connected with the paper since 1873, having purchased the property in 1875. He publishes a newsy, reliable, and excellently printed journal, ranking among the best local papers in the State. The sheet was enlarged in 1882, and its patronage is now such as to warrant its continued prosperity. THE NORTH TROY PALLADIUM was established at North Troy, May 28, 1874, by Lieut. M. T. Hatch, who conducted it as an independent sheet until 1880, when he supported Hancock. June 3, 1881, it was sold to Butterfield & Jamason, who published it as a Republican paper. January 1, 1882, Mr. Jamason retired from the firm, since which time it has been continued by Mr. A. H. Butterfield, who issues a very creditable paper. The Indian habitation of this section of the country has already been spoken of, on pages 40 and 41, to which we refer the reader. It seems that Lake Memphremagog and the other lakes and streams throughout the country were the favorite resorts of the Redmen. And for years before the territory now known as Orleans county had been visited by the whites, it was the wilderness home of these wild lords of the forest. Here they camped in its valleys, hunted on its mountains, and fished in its waters, over which they glided in their light canoes. Thence they went forth to war, fighting with savage cunning and cruelty the foreigners who came over the great waters from the east to dwell in their domains, converting the forests into the fruitful fields and smiling villages that constitute the county of which we write. The route of travel from the St. Francis village, in Canada, to their principal settlement at Newbury was laid through this section, as described on page 180. The earliest settlement of which we have any authentic history was in Charleston. It was a favorite spot with the Indian, and as late as the first quarter of the present century they would occasionally come on and camp on their old hunting ground, where the village of East Charleston now stands. In 1824, a party of this kind camped here, and one of their old men informed Jonas Allen, an early settler in the town, that a long pond once existed in the town, extending along the course of Clyde river from the Great falls in Charleston, up into Brighton, which was drained of its waters as Runaway pond was in Glover, an account of which we give in connection with the sketch of that town. The old Indian also related that it had been fifty years since his fathers had made a permanent home in this locality, at which time they remained nine years. During the whole of that time, he claimed the long pond was here, ten miles in length, with two outlets, one by a stream into Willoughby river, thence to Memphremagog. The other outlet was through Clyde river into Salem pond, thence to Lake Memphremagog. He said they were knowing to the fact of both ponds losing their waters, at the time the events occurred. The reason assigned for making this place their home at that time, was because of a division among their own tribe, they being in favor of the English, and the rest in favor of the French at the time of the French and Indian war. They remained—according to the testimony given—until after peace was concluded between the French and English, then returned to Canada. The Indians also showed where they had camped, where they put their furs and potatoes, and also showed old marks on maple trees where they had been tapped nine years in succession. This sugar lot, which was one of their camping grounds, is situated on both sides of the town line between Charleston and Brighton. These circumstances were related so clearly, and the several proofs given with so much correctness, that no one doubted the truthfulness of the Indian's assertions. After the Hazen road was put through, block-houses were erected along it at different points, one of which was located on the west side of Greensboro pond. In the summer of 1781, a party of Indians made a descent on Peacham and made prisoners of Jacob Page, Col. Johnson, and Col. Elkins, then a youth. Capt. Loveland had been stationed there with his company for the protection of the inhabitants, and in September he sent a scouting party of four men up the Hazen road. They proceeded as far as Greensboro, where, while occupying the block-house above referred to, they were, in an unguarded hour, while at a distance from it, attacked by a party of Indians. Two of the party, Bliss, of Thetford, and Moses Sleeper, of Newbury, were shot down and scalped. Their companions, having offered no resistance, were led captives to Canada, and soon found themselves prisoners with Elkins, of Peacham, in Quebec. Sometime subsequent, having been by an exchange of prisoners released, they returned to Peacham. It was not until their return that the fate of Bliss and Sleeper was made known to their friends, a party of whom at once proceeded to Greensboro, found the remains undisturbed, but in that loathsome condition naturally consequent on long exposure to the weather. A grave was dug and the putrid masses, uncoffined, were rolled into it and buried. The early settlers of Barton found Indian wigwams, in a decayed condition, quite numerous in the vicinity of the outlet of Barton pond, from which it is to be inferred that it was a favorite camping ground of the savages. It is stated that an old Indian by the name of Foosah claimed he killed twenty-seven moose, beside large numbers of beaver and otter near this pond in the winter of 1783-'84. In the winter of 1799, a small party of Indians, of whom the chief was Capt. Susap, joined the colonists of Troy, built their camps on the river and wintered near them. These Indians were represented as being in a necessitous and almost starving condition, which probably arose from the moose and deer, which formerly abounded here, being destroyed by the settlers. Their principal employment was making baskets, birch bark cups and pails, and other Indian trinkets. They left in the spring and never returned. One of the party was a squaw, called Molly Orcutt, who became quite noted among the settlers as a doctress. She was found dead on Mount White Cap, in East Andover, Maine, in 1817, having died, it is believed, at the age of 140 years. The first record we have of a visit of the whites to the territory is that of a portion of Roger's regiment on their return from the reduction of St. Francis village, in 1759. Roger's rangers consisted of a regiment of 300 men sent out by General Amherst from Crown Point. After destroying the Indian village and starting on their return journey, they learned that they were being pursued by a large body of Indians, so their main object became to get back to New England in safety. Accordingly, they divided, a part of' them attempting to return by Missisquoi bay, and were overtaken and destroyed. The remainder followed up the St. Francis river and Lake Memphremagog, then up Barton river, and thus on to the Connecticut river. When they arrived here, the provisions of the rangers having already been exhausted and some of their number become so faint from hunger that they had stopped to die, they gladly rested and replenished their stores with the fish that they found in abundance in the stream. Marks made on the trees by these soldiers, it is believed, have been discovered in several towns. A son of one of the rangers, Joel Priest, of Brownington, was a resident of the county after a lapse of more than a century. In the spring of 1827, a curious relic was found by Mr. Shubael Goodell, in Irasburgh. It was a shirt of mail, rolled together and lying at the foot of a large birch tree, between two considerable roots. It was much corroded and evidently had lain there for a great many years. It is thought to have been left by one of these rangers, though it may have some connection with the Johne Graye manuscript, mentioned on page 21. It was made of steel rings about a quarter of an inch in diameter, locked together after the manner in which wire purses are sometimes made, but much thicker and heavier. The wire of which the rings were made was nearly as large as a knitting needle, and in forming the rings the ends of the wire, instead of being brazed in the usual way, were firmly riveted. The form of the article was that of the body of a shirt, reaching down a little below the hips, with sleeves barely sufficient to protect the shoulders, and a collar covering the whole neck. This collar was of several thicknesses, made, in the manner above described, of brass or gilt wire, while a border of the same wire was formed at the bottom of the garment. The collar was open before, sufficiently for passing the head through, but, when on, could be snugly closed and fastened about the neck. It was evidently designed to protect the body of the wearer against arrows, spears, and other weapons. It was purchased soon after it was found, by Lieutenant Wilson, of the U. S. artillery, for the purpose of being deposited in the museum of the National Institute at Washington, D. C. Early explorations were made by Josiah Elkins, of Peacham, and Lieut. Lyford, both before and after Hazen's road was built. After the road was put through, in 1799, their usual route was to follow it to the head of Black river, and thence to Lake Memphremagog, where they hunted for furs, and traded with the St. Francis Indians, who then frequented the shores of that lake. Lyford also had camps on the shores of Caspain Lake, in Greensboro, the location of some of which, it is said, can be pointed out to the present day. The first actual settlement, however, was commenced in 1778, in the town of Craftsbury, by Col. Ebenezer Crafts, who during that summer opened a road from Cabot, cleared ten or twelve acres of land, built a saw-mill and made some preparations for a grist-mill, though he did not remain through the winter. In the spring of 1789, Nathan Cutter and Robert Trumbull moved into the town, and Messrs. Aaron and Ashbel Shepard, with their families, located in Greensboro. Mr. Trumbull, by reason of sickness in his family, spent the ensuing winter in Barnet, and Aaron Shepard returned to Newbury, so the families of Mr. Cutter and Ashbel Shepard constituted the entire population during that winter. On the 25th of March, 1790, Mrs. Shepard was delivered of a son, who was named William Scott, the first native born citizen of the country. From this period new settlers came in, new roads were opened, and fruitful fields began to multiply. In 1800, the population was 1,064; in 1810, 4,593; in 1820, 5,457; in 1830, 10,887; in 1840, 13,834; in 1850, 15,707; in 1860, 18,981, and it now foots up to 22,096. During the decennial period from 1850 to 1860, its increase was not only greater than any other country in the State, but than that of the whole State, and sufficient to offset an actual decrease in other counties which would have deprived the State of one representative in Congress. The first town organized was Craftsbury, March 29, 1793. The part the county took in the war of 1812, and in the late civil war, has already been spoken of in connection with the Lamoille county history, incorporating a complete roster of all who worked as officers in the cause of the Union. The rebellion of the French population of Canada against the rule of the Sovereign of England, in 1837-'39, was the cause of considerable excitement here also, as it was all along the northern frontier. It amounted to nothing serious; however, and many doubtless regretted that they had expressed so much sympathy for a cause which turned out so disastrously. For further mention of the subjects thus treated, especially of the early settlements, we refer the reader to the sketches of the various towns, and while he is turning to those pages we will bid adieu to this our hurried sketch of Orleans county.